There will be a lot of gathering together today, all around the world. People, women and men, actively objecting and actively voicing and above all being active. When remaining passive might be an option. Sticking to what one believes is right and true, in the face of abuse and ridicule, is not a one off kind of action. This story of a man in WW2, a Conscientious Objector (to not shedding blood/killing) is an example of persistently sticking to what he held in his heart as right and true. Quite something actually. He persisted to save lives in the face of losing his own. But what marks him out is that he was praying all the way, while he worked to save lives. The message here is obvious. But I’ll say it anyway. There is however a fierce love (marked by extreme intensity of emotions or convictions). Great Story! Another way of dealing with the change of president is the Byron Katie method! Do you know about her Inquiry Rev Mugo? No Eric, I don’t know about her however I’ll look her up. Glad you liked the story. 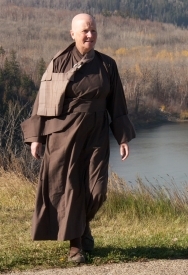 The link was sent to me by a monk in Canada. Thanks for the story about Doss. I have long admired these kinds of people — who will not kill but who go into harms way, in a just cause, to save others. This story is a reminder that love does indeed defeat hatred…and perhaps more important, reinforces the notion that courage is the greatest of all human characteristics. God Bless, Gerry. Oh good Michele. It was an amazing day for women to have turned out is such numbers, all over the world. And yes, I was clicking through mentally the demo’s I’ve been on before becoming a monk. Rock against Racism was a biggie in the ’70’s. I was doing a Documentary Course at the time and remember being up a lamp post taking photographs of the procession as it left Trafalgar Square. Then the long walk to where the actual ‘rock’ happened. And there were others but those stories will have to wait for another time. When we meet in person next.